Washington, D.C., will hold several ceremonies and services this week to honor the late President George H.W. Bush before he is laid to rest in College Station, Texas. The 41st president of the United States died Friday night at the age of 94 and was quickly remembered as a humble patriot, dedicated public servant and beloved family man. See below for the schedule of local memorial events as well as information about road closures and prohibited items. Bush's remains arrived at Joint Base Andrews in Maryland on Monday afternoon, followed by a brief arrival ceremony. Another arrival ceremony took place at the U.S. Capitol late Monday afternoon. Bush is now lying in in state in the rotunda of the Capitol, where he will remain until 8:45 a.m. on Wednesday. Public viewing will continue through Tuesday and end at 7 a.m. on Wednesday. Police said people wishing to pay their respects should prepare for any possible bad weather as the lines will start outside. Visitors will enter through the U.S. Capitol Visitor Center. They may not bring any flowers, sealed envelopes or other offerings into the U.S. Capitol or Capitol Visitor Center. Police also said visitors must silence their phones and turn off any electronic devices. Photography and video recording are not allowed inside the rotunda, according to police. The former president died at the age of 94 on Friday, Nov. 30, 2018, less than a year after his wife's passing. 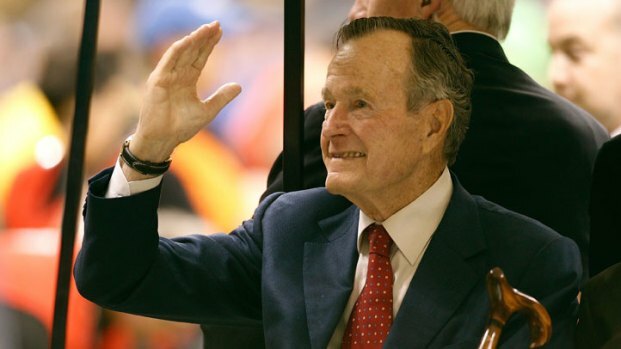 Bush's body will depart the Capitol at 10 a.m. Wednesday. There will be a service at the Washington National Cathedral in Northwest D.C. beginning at 11 a.m., which President Donald Trump said he would attend. A departure ceremony is expected to follow the service at about 12:30 p.m. before Bush's remains are flown from Joint Base Andrews to Houston, Texas, for final services. The funeral will begin at 10 a.m. at the church, which is not far from Bush's Houston residence. It is the same church where former first lady Barbara Bush's funeral was held in April. Following the funeral, Bush's remains will depart Houston via train for Texas A&M University in College Station. There, he will be buried at his presidential library next to his late wife, Barbara, and late daughter, Robin. Police may close more streets around the Capitol as necessary and officials are encouraging people to use Metro to get to the Capitol. Pointed objects (including but not limited to): razors, box cutters, knives, knitting needles, letter openers. Pens and pencils are permitted. Liquid, including water; open and empty clear or translucent bottles and beverage containers are allowed.